Ascension has been a place of worship for over 100 years. We are a place where people of all backgrounds are welcome for a service or for a lifetime. best. Our ministries, particularly our outreach, reflect our commitment as Christians. ages to live out Christ’s command to serve others. This congregation, originally known as Grace Church worshiped in Parke Hall, beginning December 3,1865. The land at our current location was purchased in December of 1896, and the first services were held here on Ascension Day, May 11, 1899, albeit in the basement of the church building. Solid stone walls and the magnificent stained glass window above the altar, adds to the feeling of history and permanence which are rooted in this building. 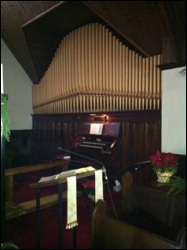 The Felgemaker organ was installed in 1912. Until 1920,when an electric blower was then installed, young boys' arms worked the hand pump. The restoration of the “Grand Old Lady”, as she came to be known, was completed in 1987. After providing one hundred years of faithful musical accompaniment to the members of Ascension Church, the Felgermaker pipe organ finally became the star attraction of the day. In October 2012 we celebrated 100 years with an organ recital by renowned organist, Gordon Turk. By having an active Vestry, a part-time Coordinator of Communication, a phenomenal Music Director, committed lay leadership, a paid bookkeeper & a dedicated congregation, we are able to work towards fulfilling our mission. Our Priest-in-Charge enhances this mission by providing great knowledge and support to our congregation.